Decades of scholarship on the early modern Atlantic has painted a picture of a world filled with a diverse array of littoral cultures.1 As imperial and indigenous populations interacted, Europeans, Americans, and Africans engaged in exchanges, transformations, and ruptures that produced hybrid cultures and revolutionary societies. In Building the British Atlantic World: Spaces, Places, and Material Culture, 1600–1850, editors Daniel Maudlin and Bernard L. Herman seek to identify cultural commonalities and continuities that marked British identity during this time of significant change. They turn to the built environment to do so. In a collection of thirteen interdisciplinary essays, the volume examines the idealized and built forms of forts, towns, public buildings, and private dwellings in the British Atlantic world. Organized into four parts that center on government, religion, commerce, and domestic life, these case studies show how English peoples created vernacular material culture that retained recognizable touchstones of architectural classicism while adapting built forms to different locales around the northern Atlantic. Part one, “Empire and Government,” explores three different architectural types: forts, public administration buildings, and—surprisingly—domestic interior designs. Emily Mann’s study of English defensive structures in Virginia, Bermuda, and Barbados gives the fullest sense of the imperial rivalries in which England engaged in the seventeenth century. She argues that although fortifications at each locale developed to meet different interests and conditions, they aimed to bolster the strength of each other and fulfill the interests of the metropole. In the second chapter, Carl Lounsbury surveys the ways that provincial builders used “the civic design kit” of English public buildings to construct provincial governmental buildings attendant to local vernacular styles and population density. (53) He argues that even the most modest town halls, courthouses, market houses, and statehouses of eighteenth-century North America included architectural expressions of public authority and imperial belonging. Anna O. Marley shifts the reader’s view dramatically in the third chapter. She turns to the dining room of Thomas Jefferson’s home, Monticello, to show the lasting influence of British visual culture in the early United States. By hanging North American landscapes around a west-facing window that opened onto a view of the Blue Ridge Mountains, Jefferson applied British conventions of landscape display to offer a vision of a new American empire stretching westward and into the future. Part two, “Religion and the Churches,” launches with an examination by Peter Guillery of the vernacular classicism of nonconforming churches in eighteenth-century England. He argues that the features they share with similar North American churches do not mark American colonial style. They instead show the persistence of English vernacular building practices that continued alongside the advent of high-style church architecture in eighteenth-century Britain. Peter Benes weighs in on the longstanding scholarly conversation about the architectural origins of colonial New England meetinghouses. In a survey of extant buildings and historic records, he asserts that British colonial builders drew primarily on “an Atlantic conglomerate” of early modern Huguenot, Dutch Reformed, and Scottish church building traditions to erect the iconic American building type. (120) Alison Stanley turns attention to a lesser studied, but no less distinctive, New England building type: the praying town. Through close readings of Puritan texts, she examines how conflicting ideas of town design and architectural construction generated conflict between indigenous residents and English settlers of Nipmuc territory. The built environment of an Atlantic economy run on the African slave trade is the focus of part three, “Commerce, Traffic, and Trade.” Christopher DeCorse offers a short survey of British forts in West Africa, built to control gold, goods, and victims of human trafficking. His essay explains how particularities of their construction, location, and eventual dissipation signal the economic interests of British architects who sought profit from the exploitation of Africa. Louis P. Nelson examines the commercial landscape erected by merchants who sought gains in Caribbean branches of the slave economy. By identifying “the emergence of the merchant shop/residence” on British islands around the turn of the nineteenth century, Nelson explains how white merchants created a regionally distinctive urban form to provide themselves with physical and social comforts sorely lacking on wharves and some streets. (188) Kenneth Morgan takes readers across the Atlantic again to examine the effects of this Atlantic trade on the western port cities of England, Bristol, and Liverpool. He shows how the merchant classes of these cities transformed the urban landscape, not only by developing waterfront infrastructure to support greater capacities of maritime trade, but also by constructing commercial and residential buildings that tied social status to civic pride and financial profit. In “Houses and the Home,” the final section in this volume, four scholars analyze domestic building types on the edges of the British Atlantic. Stephen Hague compares the houses of two middling men who exercised their entrepreneurial ambitions by crossing the empire in different directions: John Elbridge heading east, from Massachusetts to Bristol, and James Logan heading west, from Ireland through Bristol to Pennsylvania. Both men built houses whose modest but classicized forms expressed the social ascent of their owners. In the next essay, Bernard L. Herman recalibrates readers’ views of London by framing the seeming center of the empire as an “architectural borderland” in the years after the great fire of 1666. By tracking the placement of parlors and kitchens during rebuilding efforts, he shows London to be a place of great “experimentation and innovation” in domestic architecture during the third quarter of the seventeenth century. (256) He argues that new types of dwellings that emerged in the British Atlantic later in the century responded to these architectural trials in London, not simply the exigencies of colonial context. Leaving the imperial capital, Lee Morrissey dips down to South Carolina for a closer look at a particular domestic specimen: Drayton Hall. He shows how builders drew on circulating print culture to design the building as a political statement of order and admirable disinterestedness. Yet he argues that the colonial American context of the building resisted such a clear architectural statement; construction by enslaved labor in a swampy environment marked the discontinuities, hybridization, and globalization that challenged transplantation of classical forms in the Atlantic world. Finally, Daniel Maudlin moves us northward to country estates in the “political edgeland” of Nova Scotia. (291) Here, New England emigrants and Scotch Highlanders built homes that expressed a surprising level of social cohesion after the American Revolution. These domestic forms, Maudlin argues, stood in contrast to local residences of recently displaced French colonists and announced the inhabitants’ identification with the British empire. Building the British Atlantic World joins a conversation about cultural production that has emerged at the intersection of transnational histories, material culture scholarship, and place-based borderland studies. Its editors rightly characterize the book as an introduction to the ways that architectural histories can contribute to ongoing examinations of Atlantic world identities. As with many edited volumes, the diversity of case studies sometimes challenges the intellectual coherence so neatly outlined in the introduction. Even so, Maudlin and Herman acknowledge that their geographic spread does not fully capture the extent of the British Atlantic world. Future research might move beyond the focus of this volume on Atlantic seaboards to include a broader scope of locations fully integrated into the British Atlantic empire, including the Great Lakes, the Trans-Appalachian West, the Gulf of Mexico, and the British Isles. (9-10) Architectural historians might expand this study of British identity to challenge the Atlantic framework itself by joining studies that show inseparable links between Britain’s Atlantic and Indian empires.2 Nonetheless, the volume fulfills the goal of the editors in introducing readers to the numerous ways that residents of the British Atlantic made classicism a recognizable core principle of a complex built environment. Scholars of visual culture will be pleased to find that many authors also investigate the relationships between images and architecture, making it an unacknowledged theme throughout the volume. Given the postcolonial theoretical framework of the publication, the collection includes disappointingly few discussions of how colonized peoples shaped or challenged British Atlantic architecture. Alison Stanley’s analysis of indigenous architecture and town building in Natick provides a notable exception and a model for British architectural studies that account for the influence of colonized populations. Most other authors invoke cultural hybridity only as a way to understand how residents of England and the British colonies melded classical features and regionally distinctive vernaculars derived from European building practices. In the absence of indigenous or enslaved perspectives, the editors might have drawn upon scholarly literature about architecture as a tool of colonial power to describe how British vernacular builders acted as agents of colonization. Still, Maudlin and Herman have created a valuable introduction to British architecture around the Atlantic and a worthy starting point for future research. By decentering the process of cultural production, the authors of Building the British Atlantic World prompt readers to acknowledge the ways that colonists and colonized peoples helped to define commonalities in a shared British culture as well as local derivations from it. 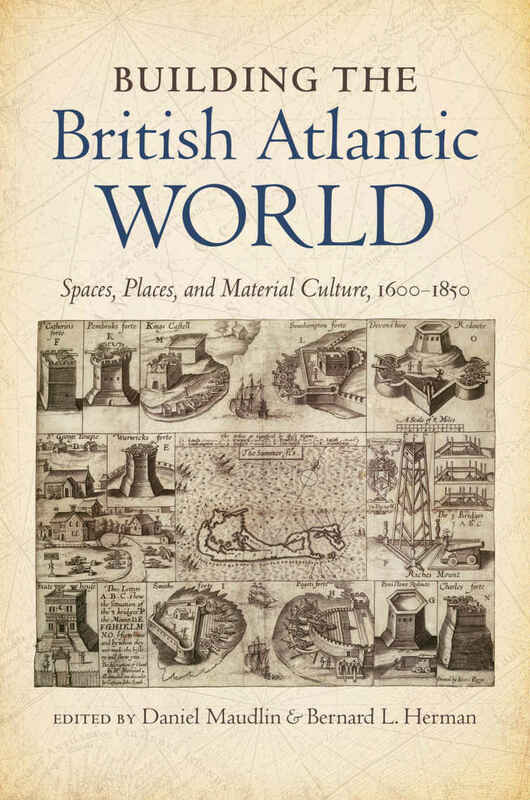 Cite this article: Whitney Martinko, review of Building the British Atlantic World: Spaces, Places, and Material Culture, 1600–1850, edited by Daniel Maudlin and Bernard L. Herman, Panorama: Journal of the Association of Historians of American Art 3, no. 2 (Fall 2017), https://doi.org/10.24926/24716839.1621. About the Author(s): Whitney Martinko is Assistant Professor of History at Villanova University.